Helen Oralee Bayes Stevenson, 93, passed away March 24, 2019 at the South Shore Nursing and Rehabilitation Center. She was born in McDermott, Ohio, March 1, 1926, to Marion Bayes and Bessie Meadows Bayes. Her parents, her younger brother Roger, and her beloved husband Charles Edwin Stevenson, preceded her in death. She is survived by a daughter, Pamela Thompson, of Ft. Mitchell, KY, and a son, Terry Stevenson (wife Cindy), of Plain City, Ohio, as well as three grandchildren, Eric Thompson, Joshua Thompson, and Rachel Kaple and 7 great grandchildren. Helen was a life long member of the First Methodist Church of South Shore, KY, where she served in various capacities, including conducting Children's Church and serving on the church council. 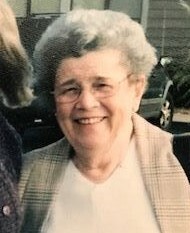 She served as a den mother to Cub Scouts while her husband was a scout master with Troop 98 Boy Scouts of America, sponsored by their Methodist church.. She also taught sewing to girls in the 4-H Club..She has been employed at the Williams Manufacturing plant, J.C. Penny's, The Portsmouth Times, and Roberson's Grocery Store. Her last hired position was well suited to the avid reader that she was because she worked at the local branch of the Greenup County Library, having finally fulfilled her desire to be a librarian. Helen was also a lifelong member of Kentucky Homemakers, serving in various leadership positions, conducting training and workshops, and winning many awards for her sewing, hand crafts and needlework at both local and state levels. Funeral services will be held 1 p.m. Saturday, March 30, 2019 at the Roberson Funeral Home with Pastor Edward Litteral, officiating. Burial will follow in Siloam Cemetery, South Shore, KY. Friends may call at the Funeral Home from 11 a.m. till the Funeral hour at 1p.m.